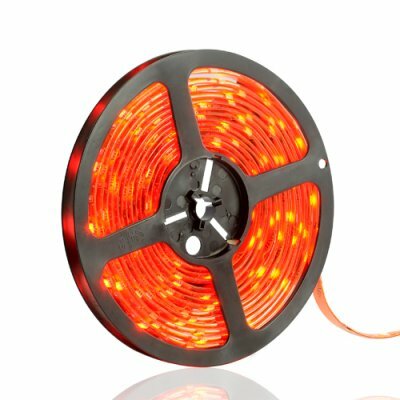 Successfully Added Direct-Stick Flexible LED Light Strip - Warm Red (5 Meters) to your Shopping Cart. Finally, a red LED light strip! This handy flexible LED strip light is great for decorating your home or office during parties, Christmas, and other special events. And it sticks directly on your wall! Have you ever wanted to decorate your house, but found that to do it well you ended up using so many different cables and power connections that what you thought would be a simple job is actually quite a nightmare? Well, with this amazing direct-stick LED strip, you can take up any creative decorative lighting job with total ease! Just wrap the strip around your plants, landscape, or stick it on to any flat surface. That’s it! No special tools or other wiring required to install this convenient lighting product. Designed for quick and easy installation, this 5 meter long LED strip can be used for architectural lighting, window lighting, sign lighting, concealed cove lighting, and even personal use at home. The LED strip light is flexible enough to be made into many shapes and mounted onto indoor or outdoor surfaces, walls and coves. The LED Strip Light is a low voltage product, making it safe for use in home installations as well as for business. Make your indoor and outdoor spaces shine bright this year with some energy efficient LED lights. This warm red LED Strip Light is in stock right now, so order yours to start enjoying the benefits of affordable architectural lighting! Just connect it to the power supply and charging power, then it will light.